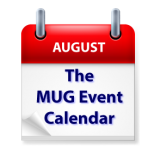 A busy week kicks off the August MUG Event Calendar. Dave Marra of Apple will show off iBooks and iTunes U to a Pennsylvania group, Aaron Davis of Apple will talk to a Virginia group about El Capitan, Apple Music and Apple Watch, and Megan O’Brien of Agile Bits will demonstrate 1Password to an Illinois group. Other topics on this week’s agenda include iCloud, Adobe Photoshop and Lightroom, Yosemite and a regional MacCamp. Tuesday 4-Aug Main Line Macintosh Users Group – Dave Marra of Apple on iBooks Textbooks, iBooks Author and iTunes U.